How do climate change and nutrients impact the prevalence of harmful algal blooms in inland waters? Harmful algal blooms are a global problem, impacting on the availability of clean water for drinking, watering livestock, fisheries and recreation for millions of people around the world. It is widely believed that climate change is acting synergistically with nutrient pollution to exacerbate the problems of harmful blooms of cyanobacteria (also known as blue-green algae), particularly in lakes and reservoirs. Changes in air temperature and rainfall, however, can affect cyanobacteria by influencing hydrology, nutrient loading, lake temperature and physical structure, and community interactions. This complexity makes it difficult to predict what the effects of nutrients, in combination with climate change, will be. The growing availability of long-term and large-scale observational data, including Earth Observation, can help bring clarity to this complexity and assess whether generalised responses exist for different types of lakes, or in different parts of the world. 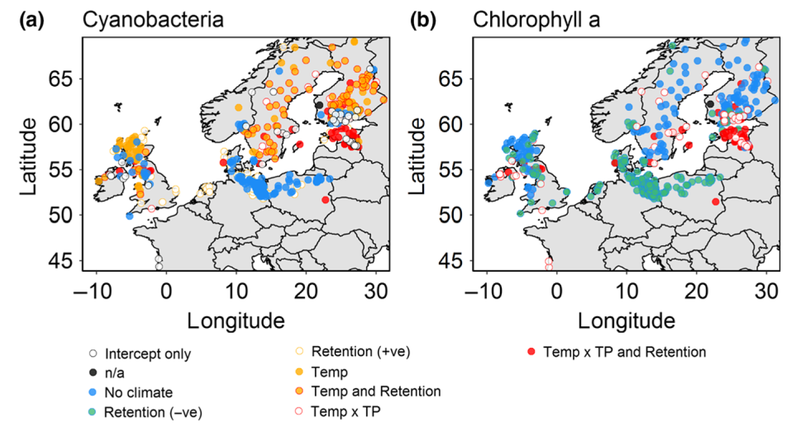 In a recent paper published in Global Change Biology (Richardson et al., 2018), we analysed data from a large dataset of approximately 500 European lakes to examine individual and interactive effects of nutrient and climate stressors (total phosphorus, temperature and water retention time). Total phosphorus generally had the strongest positive effect on the abundance of cyanobacteria. However, there was large variability among-lakes in responses to the three stressors, but when lakes were grouped by type, significant effects of temperature and rainfall were observed for some types (Figure). 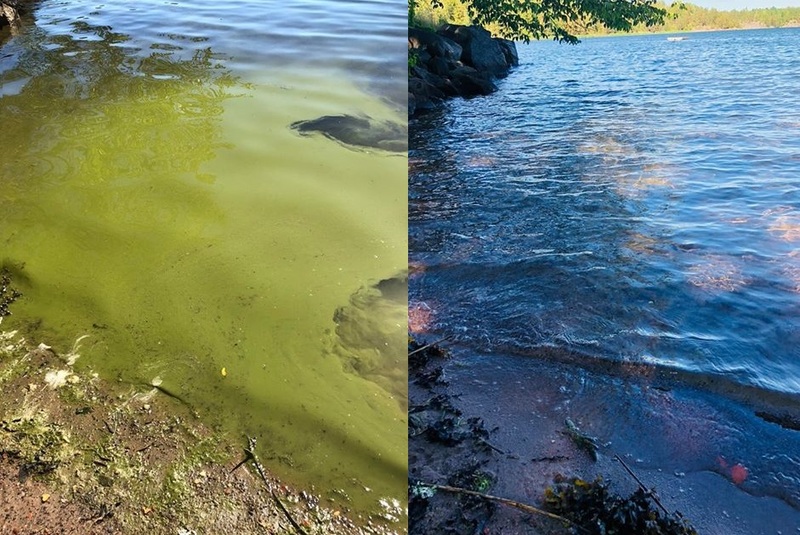 These analyses suggest that considering responses by lake type helps us to generalize the response of cyanobacteria to environmental change and to highlight particularly sensitive lake types. 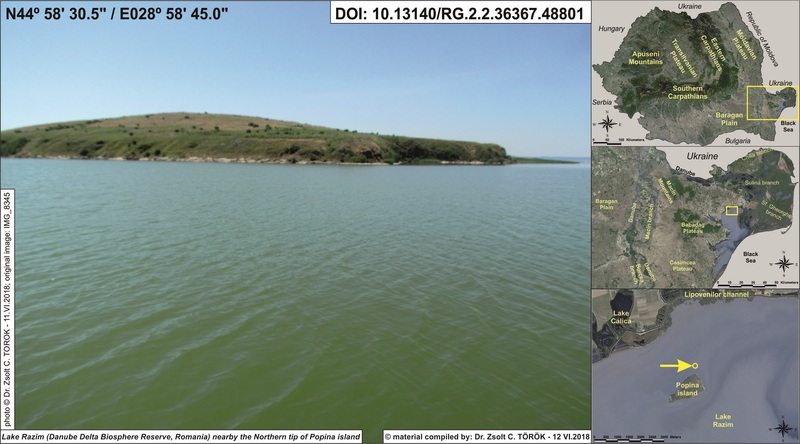 New EO data products for chlorophyll and cyanobacteria, such as in H2020 CyanoAlert may help us to understand differing sensitivities of lake types globally and could also help us understand the changing timing and magnitude of blooms. The approaches we outline for analysing in-situ data are applicable to the large datasets now becoming available with EO. 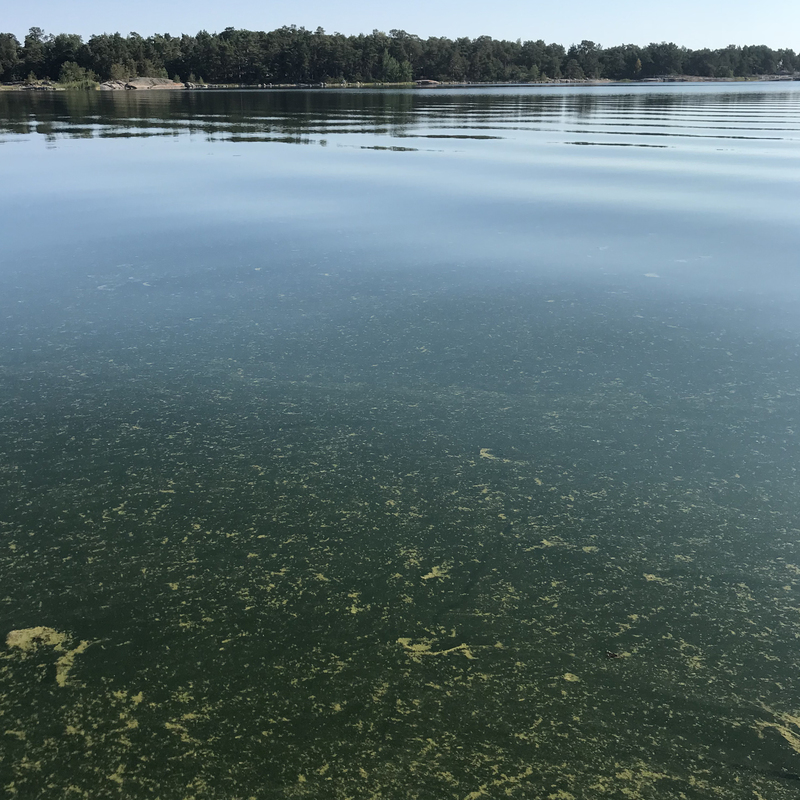 During late July and early August reports regarding cyanobacterial blooms were abundant from Kramfors (northern east-coast) though Varberg (west-coast) in Sweden, and for a time both Gotland and Öland were completely surrounded. It was not until the wind picked up in strength in the beginning of august the blooms started retreating after multiple weeks of bathe-unfriendly water in places. Potentially poisonous species like Nodularia spumigena were favored by the warm weather, and some water samples showed a high concentration of this variety. There were also multiple reports about illness after swimming, from parents as well as dog-owners. The toxicity of the water containing cyanobacteria is usually not that high that humans get ill, and this has not been reported previously with medical backup. However, other more potent species are also favored by warm water, especially in fresh water. This can be more common bacteria like E. coli, or it can be other types of phytoplankton such as diatoms and dinoflagellates. With today’s monitoring using satellite pictures to analyze the presence of algae blooms only works on the pelagic masses, since resolution is too low to reconstruct freshwater bodies and costal zones correctly. This makes it hard to follow up cases of illness and concluding the cause without making extensive water analyzes, which is both expensive and laborious during times like the past weeks. Follow-up would be much easier using the CyanoAlert technology where both chlorophyll a and chlorophyll unique to cyanobacteria is picked up, so that an exclusion method could be used to decide if the illness is due to cyanobacteria, phytoplankton or some other reason. People could also use the near-real time feature in the app to look at the local beaches and see for themselves what the water contains. Hopefully this will be available for the public to use as soon as possible! Very warm and calm weather in Stockholm archipelago, Baltic Sea. Algae accumulating at the surface. Photo: Petra Philipson, Genböte (Haninge-Stockholm, Sweden) 2018-07-15. The cyanobacteria bloom situation since mid-June has been very fluctuating. The blooms that developed up until the 21/6 were quickly mixed down into the water in an episode of windy weather. Until the 25/6 there were barely any visible cyanobacteria. After this they grew quickly to show signs of blooming through all of the proper Balic region; from outside of Ystad and into the Gulf of Finland. This then shrunk down to later again grow to similar extents. As of today (9/7), there are cyanobacteria visible from satellite pictures from Bornö Island up through the Gulf of Finland, in varying densities. Local reports have shown costal blooms especially in area between Nynäshamn and Västervik, Sweden. These fluxes of cyanobacteria blooms are due to weather conditions, which after the long high-pressure flux of May and June became a little more instable with colder temperatures, more cloud coverage and stronger winds occasionally. Normally there are expeditions going out monthly during the summer months sampling the water to get a picture of species composition. However, this year it has been delayed so there is little information about the species of cyanobacteria present at the moment. The next expedition is planned to occur mid-July. The waters have been warm enough for species like Nodularia spumigena to grow, especially in the southern parts of the basin. This is of great interest to find out since this is the species which is known to create problems for humans and animals since it can be toxic. Illustration of how quickly the accumulations of cyanobacteria can disappear over-night. Pictures taken from one beach in Dagsbo, Sweden. Photo: Louise Lundberg. Lake Razim (Danube Delta Bioshpere Reserve, Romania) nearby the Northen tip of Popina island, 11 June 2018. Photo: Dr. Zsolt C. TÖRÖK, INCDDD. This project has received funding from the European Union's Horizon 2020 research and innovation programme under grant agreement No 730141.